Navigation: Home » Personal Finance » How Much Do People Save, by Income? A few weeks back we presented one of our signature pieces of original research on what Americans saved based upon their ages. That data used fresh data from the Consumer Expenditure Survey to paint a picture – however imprecise – of savings by income. 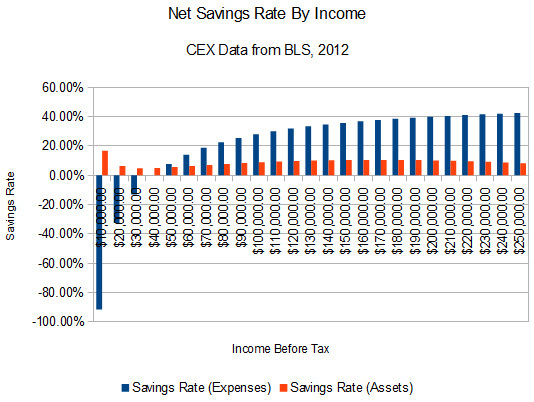 Enough said and enough graphed, here’s the promised calculator on savings by income. Enter the amount of money you made in 2012 after taxes, and we’ll bring you your point in our best fit equation (from ZunZun, check them out). As we mentioned last article, the CEX data isn’t the final word on savings rates, as self-reported income taxes are much lower than actual taxes paid. We use two methods in the chart and in the calculator to come up with the ‘savings rates’ you see in this piece. The expenses method uses income after tax and total expenses. The assets method uses increases in reported assets over the year over after tax income. Obviously, both have their downsides… but you run what you brung, right? The reality is probably closer to what you see in the asset method, but still up and to the right. As you can see in the table, measuring by assets has a weird little hitch around $140,000 – $200,000 in income after tax. Feel free to post your pet theory on that data in the comments section, I’ll eschew prognosticating on it for the time being. So – how do you stack up? Are you saving more than your theoretical American peers? I save at a 35% rate of income. My children are grown and I downsized 16 years ago. Good stuff – have you decided when you’d like to hang up the hat? I suspect the decline in savings rate as a function of assets as you increase income is that the people with higher incomes have more assets; hence, it’s harder to save a higher % of your assets. I’d hate for a high asset investor to become dismayed because he/she was only saving, say, 5% of his total net worth in a given year simply because he/she had a high net worth to begin with. I agree with this – that reading is more of a “around which income to people hit their stride?” versus a “at which income do people save the most?” type deal. Gotta use the other one, I guess?